Is it OK to be excited for an upcoming Apple event? Yep, totally. It's hard to not be, or at least mildly interested in what the Cupertino, Calif.-based technology giant will announce during its latest flashy production. Our own Global Editor-in-Chief, Patrick Goss, gave a few reasons why he thinks that it's perfectly fine to gleefully tune in, despite the almost-guaranteed accusations of fanboy-ism. 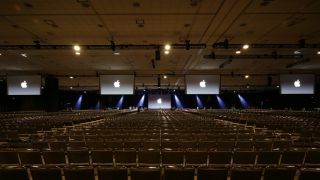 Among them is that Apple events are alluring because they bring with them a similar level of pomp to that of the annual CES, IFA and MWC conferences. The fervor makes it his favorite day of the year to be a tech writer. Contrarily, I wouldn't think tech fans crazy in the slightest if their reasons for watching the big event rise out of their skepticism of Apple's upcoming iPhone lineup. Perhaps you're watching because you're on the fence between the Samsung Galaxy S6 Edge and the LG G4, but you want to see what Apple has up its sleeves before you hit the "buy" button. Or, maybe you're in the same boat as me. As always, I'll be watching the event, but with a much more critical eye than usual. My last non-iPhone … phone was the Android 2.1-equipped HTC Droid Eris. It wasn't a fantastic experience. Ever since, I've been an iPhone customer, but I'm on the edge of jumping ship. I thought I'd never look back to another phone maker. After all, it was the best time to have an iPhone when I signed on with the 4S, what with its Retina Display, brand new Siri assistant and an industry-leading design. But for the last few years, it's as if I've just been keeping the benches warm, so to speak, watching the evolution and positive transformation of its competition from the sidelines. Let's look back at Android. The mobile operating system has improved dramatically in both function and form, and additionally, Google's working harder than ever to unite it's huge, but still splintered audience. This change in step has made me want to switch over a few times, if only to see firsthand how much has really changed since Eclair – for longer than the mere minutes I've had at press events. This is especially considering that, time and again, Apple often introduces features to iOS that Android has offered for years. And, despite the firm's recent attempts to catch up (custom keyboards, for one), there's no telling how long it will take the next time Android breaks ground with a fresh feature. Not just that, but the companies behind today's Android phones have finally embraced the mantra that less is more – a drum that Apple's been beating since day one. That's in both the design of the devices, (of which some even rival Google's own Nexus reference models) and also the cleanliness of the Android build that's stocked on a few lucky phones. Lastly, I've been tempted to switch back over because, frankly, it's where all the excitement is happening. I'm secretly (but not so much anymore) fiending to get my hands on phones like the OnePlus 2 and the new Moto G. Why? Both of these phones are available unlocked, meaning they can be activated on the carrier of my choice, and for a very digestible price, to boot. Not just that, the specs inside many of these phones match, if not exceed, what's inside Apple's latest – at least before later today. I can't count out Microsoft's Windows 10 Mobile, either. As someone who watched the previous Windows Phone campaign crash and burn, I'm genuinely excited about what's next, given Microsoft's renewed zeal in its second attempt. From even the smallest morsels of speculated information, I'm considering the new Lumia (codenamed "Talkman") as my next phone. I love the idea of syncing it up with my Windows 10 gaming desktop at home for a familiar interface wherever I go. What's Apple got to do? Like a lot of folks, I'm a customer of Apple's. But, as I stated earlier, my allegiance is beginning to shift toward what's happening outside of the iPhone's bubble. Even so, I remain interested in checking out Apple's big event mostly because I can't dismiss the likelihood that, like me, Apple has also been watching the fast-changing and growing competition. Now, it's time for Apple to utterly impress me.